In continuing my theme of reviewing assorted food items, I picked up a custard apple yesterday to give you, my dear reader, a fair and totally unbiased review of them. So let’s start at the top. This is not, despite what Woolworths is trying to tell me (and you), a custard apple. 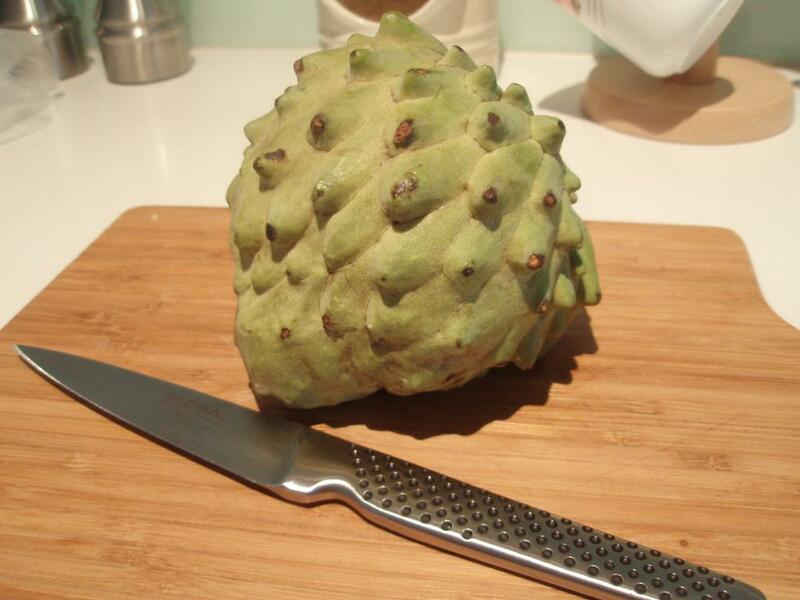 It is actually a hybrid between two fruits that, themselves, are also called custard apples, but actually aren’t – the sugar apple and the cherimoya. What we have here is an atemoya, invented in 1908 in Miami of all places. It, like many good things in life, is a hemaphrodite, and like all the even better things in life, is filled with sweet, white, oozing flesh. Outward appearance was pretty impressive. It looked fairly exotic, like something you would pull off space trees while stranded on an alien planet. 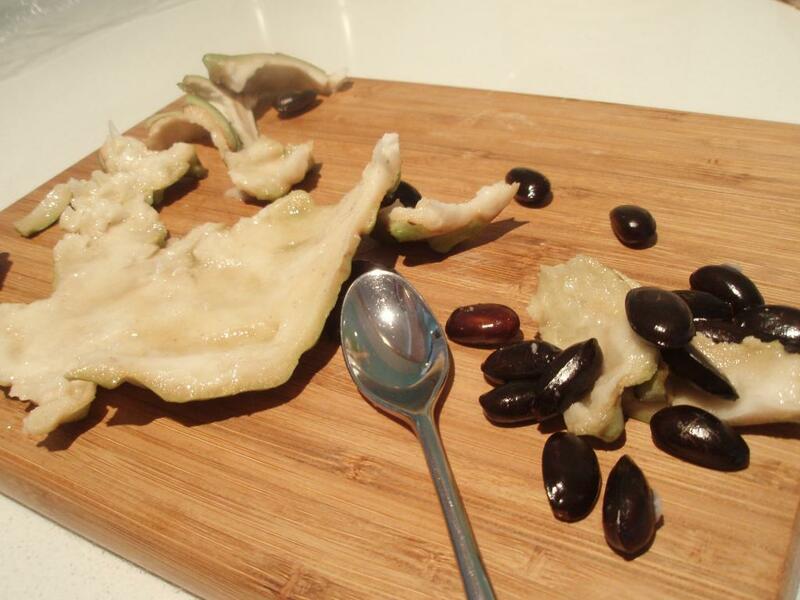 Apparently I managed to damage my precious custard apple, as when I removed it from the bag, I noticed that a large amount of sticky juice covered one half of the fruit, emanating from a bruise on the rubbery green skin. Not wanting to waste any more time, we cut it open (as usual, I deferred the cutting to my better half) revealing a juicy, slightly off-white interior, dotted with randomly placed black seeds (that are apparently highly toxic). It had a very unusual, fresh-smelling aroma, which can only really be described as smelling vaguely like an asian grocery. We had to eat the flesh with a spoon, and it was basically impossible to extract the seeds without sucking the fruit off them. It had an incredibly sweet initial taste, which actually reminded me of a lychee more than anything else, but it had a lingering, semi-sour aftertaste, and lacked any sort of perfumed flavour. 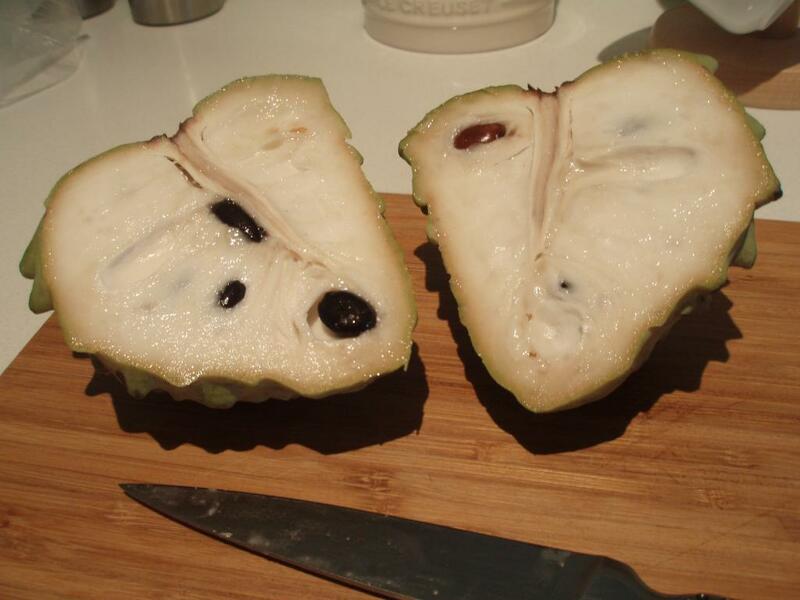 The custard apple (as well as the faux custard apples) is so called due to the supposed resemblance between the interior flesh and custard, in taste and texture. Like many of these sorts of names, they seem to imply a certain degree of parhaps undeserved overenthusiasm on the part of the nominators. Last I checked, custard wasn’t known for its fibrous texture or mysterious aftertaste. Frankly, I was a bit disappointed – I suppose I just wish there was a fruit that was exactly like a big ball of vanilla custard in an exotic skin. We got through one half (although admittedly I didn’t eat that much – it caused an allergic reaction), and shoved the second half in the fridge. I have since read that it is best served chilled, so I have high hopes for part two. I admit, this gets a huge boost for being so exotic. If I had to eat these all the time I’d quickly get angry and hateful, but it was an interesting and not unenjoyable experience. I think it should be enjoyed in small amounts. Hurry up an review Durian already. I have been asking him the same thing for literally DAYS jivan!